Since it started at the beginning of the 20th century, the audio industry has always been searching for new methods of achieving the best possible reproduction of the audible frequency spectrum. In the early years, the radio industry was the great driving force behind innovations. But it was not until the FM-band was introduced (not so very long ago) that "high fidelity" broadcasting could be considered. But for professional audio technology the emerging film-industry was much more important. After all, the sound system had to be suitable for large groups of people and, for those days, high demands were also made on the high fidelity of sound. So it is no surprise that it was precisely this industry which provided major progress. In those days only tube amplifiers were used for signal amplification. The engineers of that day had to do without the transistorized amplifiers we have now, with their high outputs (more than 500W). A top notch design tube amplifier then supplied some 50W. So this output had to be converted to audible sound as efficiently as possible. But a dynamic loudspeaker (as we still know them now) is an ineffective "converter". Only 0.1 - 3% of the electric energy is converted into acoustic energy (=audible sound). The reason for this is the very unequal proportion between the moving mass of the loudspeaker cone on the one hand and the air mass moved by that cone on the other. In the ideal case this proportion should be 1:1. For dynamic loudspeakers, however, this is usually 50 to 100:1. This factor is directly responsible for the very poor efficiency. But the engineers of those days obviously did not leave it at that. A scientific article was published as early as 1920 in which this problem was solved. An "acoustic transformer" was invented which would "couple" the heavy cone mass via a so-called horn to a larger air-mass which improved the proportion mentioned above and considerably increased the efficiency. These horns are still used today. The same article also reported on the principle which would give its name to generations of high-tone speakers. Thus the "Volume Compressor" was described. This technical invention raised the efficiency of loudspeakers even further. All professional medium- and high-frequency loudspeakers manufactured since then are therefore designated by the general English expression "Compression Driver". The principle is simple. The loudspeaker is coupled to a chamber with a very narrow opening. 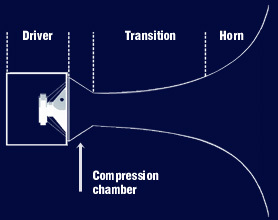 As the cross-section of this opening is less than the cross-section of the loudspeaker, compression is induced in the chamber when the cone moves. This small opening in turn is coupled to the above mentioned horn but now at an even higher ratio and with larger final cross-sections. The result is even higher efficiency. In the years before the Second World War, this combined system also made it possible to generate an adequate acoustic output using a low amplifier output. But then there is the old saying "Nothing ´s for free". Here too. The compression mechanism adds additional distortion and the mechanical construction clearly limits the maximum output. Compression drivers therefore tend to sound irritable at high outputs (professional loudspeakers are generally used at the limit of their maximum output in practice; Distortion figures of some 25% are then customary). But greater efficiency was crucial in those days. There was no alternative to accepting the drawbacks. Since then there has been no change in the operating principle. 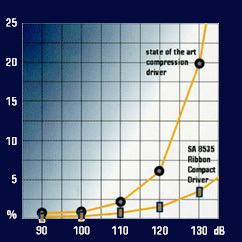 All current compression drivers use the compression chamber to generate acoustic energy. For 75 years minor improvements were always being made, but the idea was never abandoned. In 1983 Stage Accompany started an ambitious project with the aim of making a different type of loudspeaker suitable for professional applications. This was based on one fundamental consideration. The present amplifier output must allow the development of the high-tone loudspeakers which no longer use the compression mechanism, to produce a pure sound, particularly at the customary high outputs. The special and simple design of the SA 8535 is probably the most important reason for the unprecedented sound quality produced by this ribbon type loudspeaker. Moreover, the recent development of new magnet material and cast-iron plastic film has contributed to the creation of the SA 8535. Compression drivers are provided with the compression mechanism mentioned above. The SA 8535 Compact Driver operates without this compression space. The "diaphragm" in the Compact Driver generates the sound and transfers it directly to the ambiance. This results in an extremely pure, undistorted sound and much better reproduction of the highest frequencies. The concept of "listening fatigue" no longer occurs with Compact Drivers! One of the striking differences between Compact Drivers and compression drivers is the method by which the diaphragm is driven. In compression drivers the forces are generated by the voice coil which are subsequently transmitted to the relatively heavy, poorly controllable, dome-shaped diaphragm with a 4-inch diameter. In Compact Drivers the voice coil and the diaphragm are integrated. This is a much simpler principle which produces enormous weight-savings (approximately 80%). This integration prevents the occurrence of the so-called "break-up phenomenon"-the most difficult phenomenon to be suppressed in loudspeaker technology. Break-up occurs when some parts of the diaphragm can no longer follow the forces applied to them. The diaphragm then starts to vibrate at random. This leads to aggravating and irritating reproduction. The SA 8535 Compact Driver is the unrivalled winner in the field of clarity and dynamic reproduction and leaves the compression driver far behind in performance. Spectral decay plot for the Ribbon Compact Driver , the SA 8535. The plot clearly shows a very good time behaviour because the driver uses an ultra lite direct radiating voice coil. Spectral decay plot for a state-of-the-art compression driver. Due to the high moving mass of a compression driver, the spectral decay plot shows severe time smear. Long after the inputsignal has stopped, the radiating parts of the driver are still moving. This results in higher overall distortion in the upper frequency regions. This frequency dependant time behaviour is what causes the listening fatigue. The SA Ribbon Compact Driver clearly does not have these problems. Very high efficiency has been realized in the SA 8535 by using "Neodymium" magnet material. Neodymium is so strong that it was possible to make a magnet with twice the strength. As Neodymium itself is ten times as strong as the ferrite magnet material as used in ordinary loudspeakers, a considerable saving in weight was also realized (some 70%). The low weight of the SA loudspeaker systems makes them easier to handle during transport and simpler to install. Finally, the simpler design of the SA 8535 makes it much more compact (hence the name). All SA loudspeaker systems are therefore smaller in size. This brings great advantages in the design of large systems; Low weight, minimum dimensions and much better control over the sound distribution. And during storage and transport this also means savings in space and therefore costs. 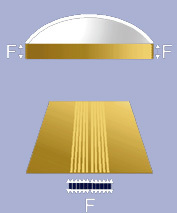 Ribbon tweeters have traditionally been characterized as fragile, with low power handling, low efficiency and low impedance. As a result of SA's "learning curve" of over 15 years in pro-ribbon technology, the SA 8535 features a frequency response of 1kHz. to 30kHz., a power handling of up to 2000W, a sensitivity of up to 107dB @ 1W./1m. (all at 13 Ohm impedance). Depending on the application the RCD comes with or without Wave-guide, with ContrAD (widens vertical dispersion), with AIR-system (doubles power handling), with aluminum baffle, and others. Most frequently asked question is "how durable is the diaphragm"? With today's digital dynamics, the output demand of frequencies in the "fidelity" area of 10kHz. to 16kHz has increased dramatically. Increasing power in this area makes the "break-up" problem of a compression driver even worse (remember, 16kHz. = 16.000 cycles per second!). Under practical circumstances, the Ribbon diaphragm has proved to be even stronger than the compression driver diaphragm. Now high "concert sound" power output has been combined with "studio sound" sound quality. Unequalled intelligibility and clarity at unprecedented sound pressure levels make this technology much more than "just a new type of loudspeaker". It's "experiencing" instead of "listening"….